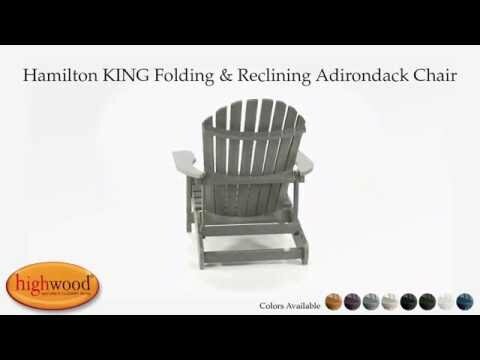 Our ever popular Hamilton Chair is truly a design icon and is part of our Highwood Adirondack Collection. This King size version is indeed regal and offers more width and height than the regular sized Hamilton. We have listened to your feedback and, this year we have added extra hardware and introduced a slight redesign to make it even more stable and sturdy. Combining timeless styling, comfort, and functionality it is a chair that is incredibly versatile and your go-to chair for instant relaxation. Over the years this chair has been used by customers in rustic cabins, poolside, beaches, patios, decks and around fire pits and it looks equally at home in each of those surroundings. The chair has a gently curved back and is able to fold down for storage and transportation. The Hamilton also features a reclining option that allows you to adjust the angle of the chair back (not while seated in the chair) to your preference. The chair has been load-tested, per ASTM F1858-98 (2008) standard for Outdoor reclining plastic furniture, and has a 400-pound weight capacity. Some assembly is required (see assembly guide). Very easy to assemble appears to be a quality, sturdy product. I was skeptical that these would look good and be foldable, but I was wrong. They are so nice and I expect they will last a long time. Not too difficult to assemble and very sturdy. Shipping took only 2 days. They look great on our patio and fit me perfectly. I'm 6'2" and 240 pounds. Feels sturdy and comfortable.